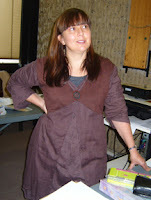 On the 4th August 2012 Carolina Geldenhuys of the Roodepoort Museum presented a workshop on the history of scrapbooking. In addition she discussed the causes of deterioration of photographs, which plastics are more suitable for storage of information, materials needed for scrapbooking and the seven steps to success with your project. She also spoke about the scrapbooking trends for 2012. There was a practical demonstration of the technique of marbling of paper, which is an inexpensive method of producing pretty patterns on paper, which can be used in various ways in your scrapbooking project. The twelve participants enjoyed experimenting with this technique and very quickly produced a variety of interesting marbled effects. We wish to thank Carolina for this interesting and useful workshop, for the photo copies of the notes, the many scrapbook pages on display, and the materials needed for the marbling. Thanks to Martie Singer for serving the tea. This workshop was subsidised by the City of Johannesburg. Thank you to Carolina for presenting the workshop, and to Petro Meyer, whose idea this was, and for advertising this workshop within our genealogy group. Margaret Humphries, Lynette Swanepoel, Petro Meyer, Edith King, Marie van Aswegen and Penny Evans participated in this fun day. We certainly came away with new ideas for recording our family history in a scrapbook.